The holidays are here. 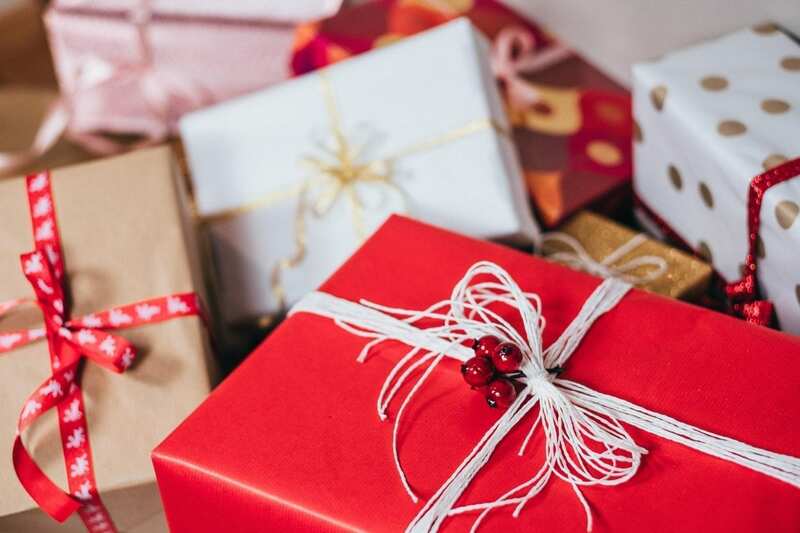 Are you feeling the pressure to find the perfect gift? It can be increasingly difficult when shopping for a game lover with unique style. From the various styles of pool tables to choosing which size ping pong table will fit in your living room; each game provides a different type of experience. We’ve compiled a list of some of our favorite products online and in our showroom to help you on your shopping journey. Foosball is a game that the whole family can enjoy together, requires only a few pieces, and can fit in any room you choose! These tables are great for indoors, as they don’t require any extra setup and are smaller than most game tables, allowing for more free space in your home. 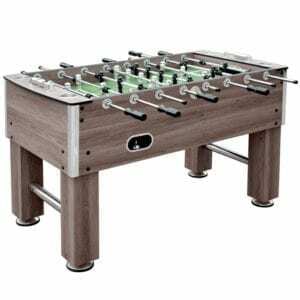 Our premium-grade Driftwood 56-inch Foosball Table is the flagship of our entire Hathaway Games line of foosball tables. This stylish table has durable exterior melamine with a beautiful driftwood finish, so you can seamlessly fit this design into your decorated home. Each side of the table contains 2 drink holders, so you won’t have to stray too far for a beer while you’re in the middle of a game. Plus, this table is $200 off right now! If your special someone has a taste for the classics, you can never go wrong with a billiards table. It might not fit under the tree, but it will surely be the center of attention in any room! A pool table is a worthwhile investment, as it will be apart of your family’s memories for years to come. The Harper Pool Table by Generations, our own original collection, features tastefully carved detail with its double arch cabinet, scalloped carved legs, and leather pockets; creating a beautiful design to incorporate into your home. This table is made from solid Aspen wood to for long lasting support. The unique design allows the frame and carved legs to flow into each other to create a beautiful piece of furniture with just enough detail to amp up any living space. While a pool or foosball table may be the first choice for most, the game of shuffleboard creates a unique type of gaming environment. From the pubs to your home game room, a shuffleboard table will provide a sleek, retro look in your home while giving your household an opportunity to unwind after work. This is the perfect gift for those who have an eye for modern gaming designs. Our 9-foot Carmelli Avenger Shuffleboard Table is a gift nobody will stop appreciating. The beautiful black melamine cabinet style creates a beautiful, classic look for any home. The sturdy pedestal legs and adjustable levelers provide optimum stability and level play for players for all ages and levels. The Avenger features a slick, poly-coated playing surface to keep pucks sliding smoothly and padded gutters that reduce noise during play. Table Tennis is an action-packed game that brings the whole family together for come friendly competition. If you are looking for a gift for the adrenaline junkie in your life, look no further. Bring the exciting game of table tennis inside without sacrificing the aesthetic of your home with a sleek game table. 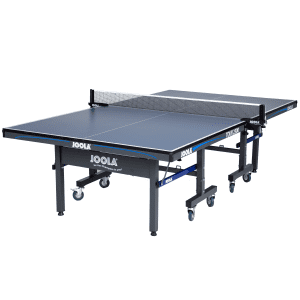 Our JOOLA Tour 2500 Indoor Table contains the optimal level of strength and thickness to help give each player a consistent bounce. A sleek frame and separable nesting halves make this table perfect for compact storage. This is table is a great way to start off holiday celebrations, as it comes 95% pre-assembled and is ready to play in just 15 minutes! When it comes to choosing a holiday gift to add to your game room, most of the time, an air hockey table doesn’t immediately come to mind. These game pieces are mostly known to be played in an arcade, but we know otherwise. 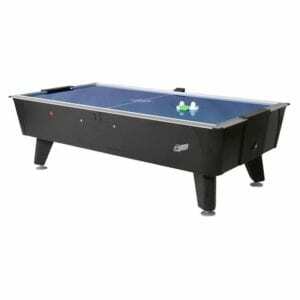 When you are investing in a Dynamo Pro Style Air Hockey Table, you are investing in quality. The home air hockey table is a unique, yet nostalgic piece that will bring you back to your arcade days. Spice up your game room with this commercial style table. It has all the toughness and time-tested durability of our widely-respected Dynamo Coin tables, but without the worry of having a roll of quarters to play. Finding a game that everyone in the household will enjoy and use can be almost impossible. When the kids are too small to participate in real-sized billiards, bumper pool will be their favorite choice. 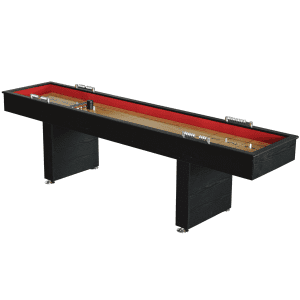 Our Renegade Slate Bumper Pool Table offers outstanding durability and value to any family. 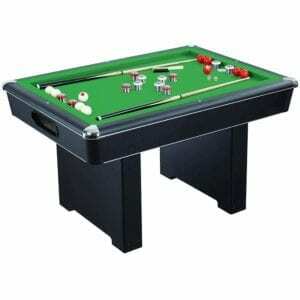 This table is much smaller than normal pool tables, allowing it to fit in smaller spaces. The sturdy black cabinet includes rugged pedestal base legs with levelers to keep the table steady when the competition heats up. 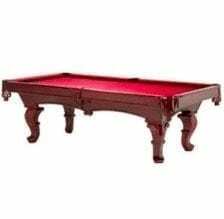 This pool table comes with everything you need for a quick round: two 48-inch cues, 10 bumper pool balls, a table brush and chalk. With our Rock-Ola Jukebox, finding a gift that your music lover will appreciate is simple! As classic retro piece, a jukebox can bring a warm and welcoming environment into your home. It can seamlessly fit into many interior styles, while keeping your guests entertained at your upcoming holiday party. The Rock-Ola Gloss Black Music Center is the next generation in luxury music systems for the home. It is a full service music management system that allows you to load, organize, and play your CD music collection with a touch of your finger. With such a variety of game pieces to choose from, you can always find the perfect addition to your special someone’s game collection at Games For Fun. Stop by our showroom to see and experience all of our game tables in person, we would be happy to help you find the game that will stay in your family for years to come. We offer flexible layaway plans, financing programs, price matching, and will ship your gorgeous new game piece to your home for free. Get an amazing first look at what your future game room could look like!